We aim to deliver our log cabins within 3-8 weeks once an order has been placed and paid for, stock cabins within 3-4 weeks and cabins we produce after the order has been placed, we are able to deliver within 5-8 weeks. Delivery time for bespoke cabins is between 8 and 12 weeks. The most accurate delivery times are shown on each product page. As a rule, we deliver our products on a Hiab crane truck, so we can unload your log cabin as soon as it reaches your desired location. 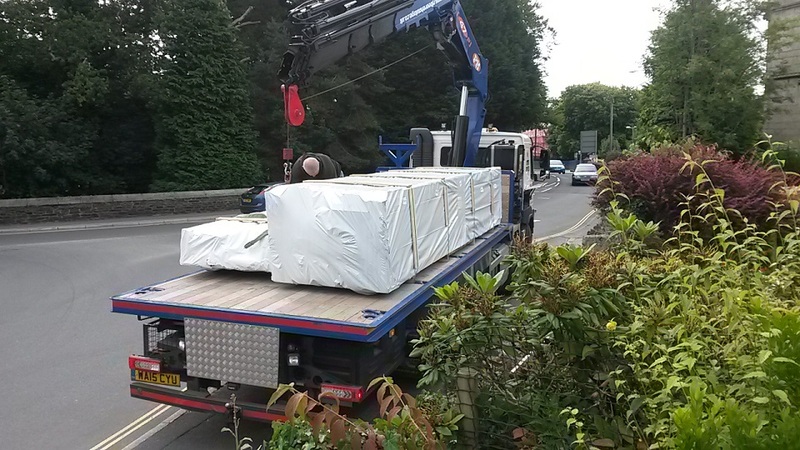 In order for this to occur, the delivery spot must be accessible for a 10m long and 12 ton vehicle and there must be sufficent space to unload safely. If this is not the case, we may have to charge you a delivery fee. Please be specific about the most convenient spot for us to offload your log cabin. We make every effort to comply and get the cabin as close as possible to the desired location. Be aware though, that due to the weight and capacity of the truck, we may not always be able to place your cabin exactly where you want it. Our log cabins come packed in a weatherproof packaging. The parts can stand outside for several weeks before you construct your log cabin. If you feel that delivery on a smaller vehicle would be more appropriate, please don’t hesitate to contact us. However, as the smaller vehicles are not able to carry a forklift or possibly a hiab, the driver would require sufficient assistance with unloading the cabin. If you are concerned about delivery or any other aspect of your log cabin please contact us. Delivery charges will be calculated by our website and automatically applied to your order during the checkout process. All deliveries must be received in person at the delivery address or by an appointed person, and a signature must be provided. If your products remain undelivered despite our delivery service provider making at least 1 attempt to deliver them, the delivery service provider or we will send you a note, with instructions on how you may collect your products, including a time limit for collection or we may agree to arrange for re-delivery of the products, however, we reserve the right to charge you for the actual costs of re-delivery even where the initial delivery was free of charge. e) there is no person available at the address for delivery to accept delivery and provide a signature.